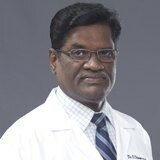 Dr. Dharmarajan completed his M.B.B.S and obtained his D.T.C.D from Madras Medical College, Madras, Tamil Nadu, India. He has worked as an assistant professor, associate professor and professor in the Department of Cardiology. His specialised area of interest is Non-invasive Cardiology. Dr. Dharmarajan has a keen interest in conferences and workshops. He has attended over 40 National and International Cardiology Conferences. Dr. Dharmarajan can fluent speak English and Tamil.